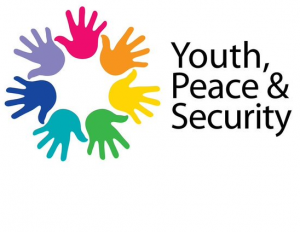 United Nations Security Council Resolution 2250 (UNSCR 2250) is the first resolution on youth, peace and security. Adopted by the UN Security Council in 2015, the resolution emphasizes the importance of youth as agents of change in the maintenance and promotion of peace and security. The resolution highlights Participation, Partnerships, Prevention, Protection and Disengagement and Re-integration as five pillars for action related to young people’s contribution to peace processes and conflict resolution. Progress Study: UNSCR 2250 requests the Secretary General “carry out a Progress Study on the youth’s positive contribution to the peace processes and conflict resolution” and to present the results to the Member States of the United Nations. 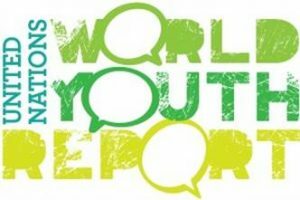 The Youth4Peace portal offers an overview of the Progress Study on Youth, Peace and Security and its organizational structure, as well as access to background papers and summary reports based on youth consultations. 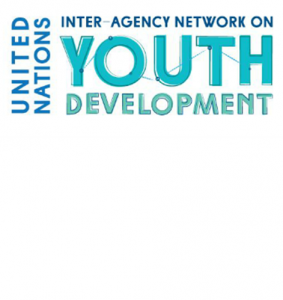 The Working Group on Youth and Peacebuilding (WG-YPB) is part of the UN Inter-Agency Network on Youth Development (UN IANYD). It is co-chaired by United Nations Peacebuilding Support Office (PBSO), the United Network of Youth Peacebuilders (UNOY) and Search for Common Ground (SFCG) and brings together an array of civil society organizations, youth-led organizations, UN entities, donors, academia and inter-governmental bodies. It provides guidance and support to the growing community of practice on youth, peace and security and helps coordinate the translation of UNSCR 2250policy into practice. Some of the Working Group’s efforts are showcased below. The Working Group developed the Guiding Principles on Young People’s Participation in Peacebuilding, which defined nine overarching principles to ensure meaningful involvement of young people in building peace and helped shift policy discussions towards the recognition of young people’s role for building peace. The 2015 Global Forum on Youth, Peace and Security, hosted in August 2015 by the Hashemite Kingdom of Jordan, was a gathering young people, youth-led organizations, non-governmental organizations, governments and UN entities who met to unite with young people in preventing conflict and building lasting peace. The Global Forum culminated in the adoption of the Amman Youth Declaration, which called on the Security Council to adopt a resolution on Youth, Peace and Security and highlighted key areas where the international community should partner with youth. 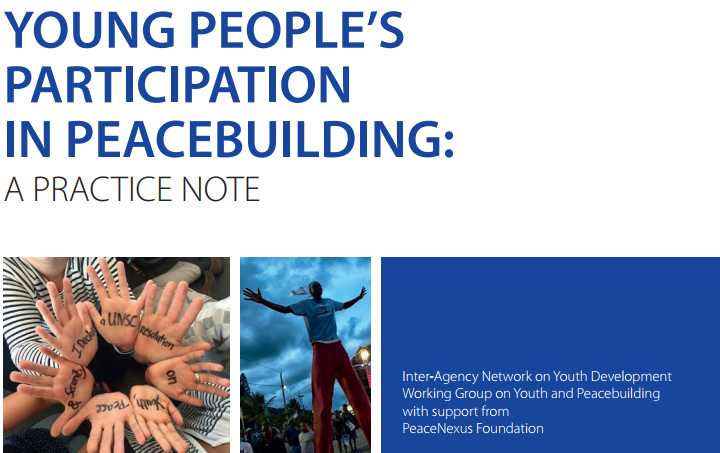 Practice Note on Young People’s Participation in Peacebuilding was created to aid policymakers and donors in supporting young people’s participation to peacebuilding. 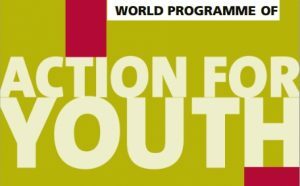 Specifically, the Note has been developed to offer evidence-based, promising practices in youth peacebuilding, advance the understanding of donors and policy-makers of complex policy and programmes, and increase the effectiveness of policies and funding strategies of donors and agencies supporting youth peacebuilding interventions. 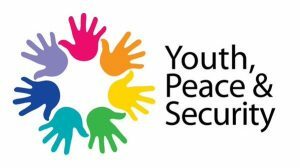 The Peace Building Support Office (PBSO) assists the Peace Building Commission with strategic advice and policy guidance, and administers the Peace Building Fund, which recently launched the second Youth Peacebuilding Initiative (YPI). PBSO is the co-chair of The Working Group on Youth and Peacebuilding and has helped develop several valuable resources on youth involvement in peacebuilding such as the Practice Note on Young People’s Participation in Peacebuilding and Guiding Principles on Young People’s Participation in Peacebuilding mentioned above. PBSO is co-leading, with UNFPA, the Secretariat for the Progress Study on Youth, Peace and Security. 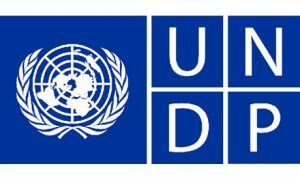 The United Nations Development Programme (UNDP) helps countries develop solutions, policies, institutional capabilities and leadership skills in areas of sustainable development, climate and disaster resilience, and democratic governance and peacebuilding. Notably, the UNDP developed the Youth Global Programme for Sustainable Development and Peace which is a global 5-year programmatic framework on youth empowerment, designed to address challenges to peace young people face worldwide. The United Nations Education, Scientific and Cultural Organization (UNESCO) works to strengthen ties between nations and societies so that every citizen has access to education, freedom of expression, cultural diversity and scientific advancements. Through these means, UNESCO aims to “build peace in the minds of men and women.” Youth are a priority group for the Organization. As such, UNESCO’s unique, cross-sectoral response to Security Council Resolution 2250 on Youth, Peace and Security, puts young women and men at the very heart of addressing the root causes of violent extremism. The collaboration between Education, Social and Human Sciences, Communication and Information and Culture ensures that young people are provided with the skills and support required to lead the global movement towards the creation of a peaceful world. Learn more about UNESCO’s 2017 International Youth Day celebrations here. The United Nations Population Fund (UNFPA) is concerned with supporting maternal health, reproductive rights and advocating for young people. UNFPA invests heavily in youth, and as such has created publications such as Will you Listen? Young Voices from Conflict Zones and Adolescent Girls in Disaster and Conflict which highlight the necessity of empowering young people in countries experiencing violence. UNFPA is co-leading, with PBSO, the Secretariat for the Progress Study on Youth, Peace and Security. 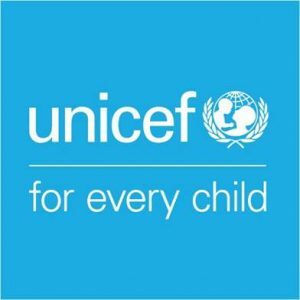 The United Nations Children’s Fund (UNICEF) works to protect the rights of every child. UNICEF established C4D platforms which facilitate opportunities that amplify the perspectives and voices of children and women, and which contribute to adolescent and youth engagement in peacebuilding. The organization was also a partner in the four year ‘Learning for Peace’ (Peacebuilding, Education and Advocacy Programme (PBEA)) between 2012 and 2015. Youth4Peace: The Youth4Peace Global Knowledge Portal is a partnership between the United Nations Development Programme (UNDP), the United Nations Peacebuilding Support Office (PBSO), Search for Common Ground (SfCG) and the United Network of Young Peacebuilders (UNOY), working together through the inter-agency Working Group on Youth & Peacebuilding. The platform, launched in 2016 to promote and support the implementation of UN Security Council Resolution 2250 on Youth, Peace and Security, contains useful resources such as a guide on translating Youth, peace and security policy into practice and a Youth Toolkit, developed by UNOY, intended to help those interested in beginning to implement Resolution 2250 locally and nationally. Furthermore, the Youth4Peace platform features a page dedicated to helping people understand Resolution 2250, and contains valuable publications such as Transforming Violent Extremism: a Peacebuilder’s Guide and regional peace and security studies. World Youth Report: Prepared by the United Nations Department of Economic and Social Affairs, the World Youth Report on Youth Civic Engagement explores young people’s participation in economic, political and community life with a focus on youth civic engagement among Governments, young people and researchers. A section on youth engagement in peacebuilding can be found in Chapter 4: Community Engagement. Resolution 2282: Resolution 2282, adopted in 2016, emphasizes the importance of national governments and authorities in identifying and directing strategies and activities for sustaining peace and preventing conflicts. It reaffirms the importance of youth in the deterrence and resolution of conflicts and their role as key aspects of sustainability, inclusiveness and success of peacekeeping and peacebuilding efforts. Resolution 1325: Resolution 1325 is a landmark resolution which emphasizes the important role of women in the prevention and resolution of conflicts, peace negotiations, peace-building, humanitarian response and post-conflict reconstruction. It stresses the significance of equal participation and involvement in all efforts for the promotion of peace and security. The resolution also urges all actors to increase the participation of women and incorporate gender perspectives in all United Nations peace and security efforts. 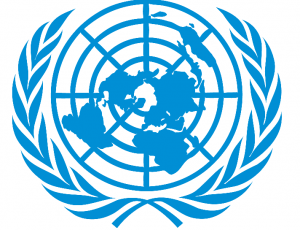 A/69/399-S/2014/694: A Report of the Secretary-General on Peacebuilding in the aftermath of conflict focuses on United Nations peacebuilding efforts in the aftermath of conflict, with a particular emphasis on women’s participation in peacebuilding. S/2010/466: A Report of the Secretary-General on Women’s participation in peacebuilding, with a particular focus on the needs of women and girls in post conflict situations.